Nike, the leading manufacturer of sports equipment has designed a new sport watch for runners. 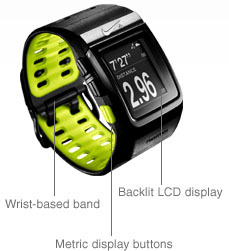 The new Nike+ Sport Watch provides features like GPS tracking, stores run data and encourages you to run. The unique watch sports a backlit LCD display which can be customized. The sport watch is also capable of both outdoor and indoor tracking. So wherever you run, it tracks you on all type of terrains. The Nike+ Sport Watch is powered by TomTom, a Dutch manufacturer of automotive navigation systems. Global Positioning System along with Nike+ sensor accurately locates and tracks your distance, pace, time and calories burned. The Nike plus sensor fits only to Nike+ ready shoes. The sensor incorporates an accelerometer to provide the statistics. Run Reminders reminds you to run by storing your stats up to 50 runs. It keeps tabs on your personal records and gives encouragement along the way. You heart rate during the run can also be monitored by adding a Polar Wearlink+ Transmitter. Once Nike+ Connect Software is installed on your computer, Plug the USB contacts on the watch strap into computer’s USB port to upload the run data and charge the watch battery. By uploading the data to Nikeplus.com, you can see your running routes, elevations and assign goals. Also view the routes your friends have shared. It lets you to find the best areas to run and share your activity on social media like Facebook and Twitter. Display Backlit LCD with the ability to invert. Display Metrics and Animations Calories, Time (12 or 24 hour), Battery Status, Charging, Time Elapsed, Average Pace, Instant Pace, Stopwatch, Alarm, Distance, History, Records, Tap Functionality, Backlight, Laps, Intervals, End of Run Messages, Run Reminders and Attaboys. Works with heart rate monitor. 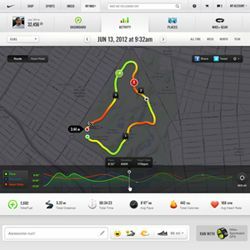 Nike+ connect software to sync with computer.